The first suburban condo to be launched this year sets the bar for other upcoming launches in terms of its size and location. And it has recently received a boost from the Cross Island Line. One of the most anticipated launches this year is The Florence Residences, the 1,410-unit private condo located on Hougang Avenue 2. “It is the first of a handful of suburban mega projects – with more than 1,000 units – to be rolled out this year,” says Ismail Gafoor, CEO of PropNex. Hong Kong-listed, Shenzhen-based Chinese developer, Logan Property, will preview the project on the weekend of Feb 16-17, and is not leaving anything to chance. 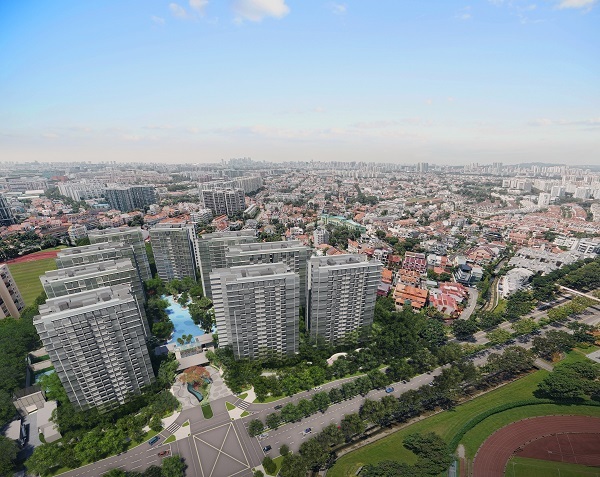 It has appointed five property agencies to market the project: ERA, Huttons Asia, OrangeTee & Tie, PropNex and SRI. The Florence Residences is the redevelopment of the privatised HUDC estate, Florence Regency. When the estate was put up for sale by JLL, there were three bids at the close of the tender: one was above the reserve price of $600 million, and two were below. None of the developers was prepared to match the $629 million valuation by independent valuers at Colliers International. That was until Logan Property swooped in and offered the price in October 2017. According to CB Chng, executive director of Logan Property, what attracted the developer’s attention was the sprawling 389,239 sq ft land area. “When you have a large site, you have the opportunity and the scale to create something different,” he says. The Florence Residences will have a resort-style, “club condo” concept – 15 themed pavilions, 12 clubs and 128 different facilities including an 80m lagoon pool, which is the central feature of the development. More importantly, the facilities cater to all ages – from toddlers to grandparents – adds Chng.